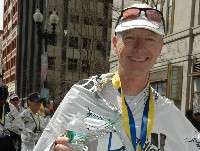 In this series of posts, I’ll give you behind the scenes look at how a busy middle age professional, prepares for a Marathon. 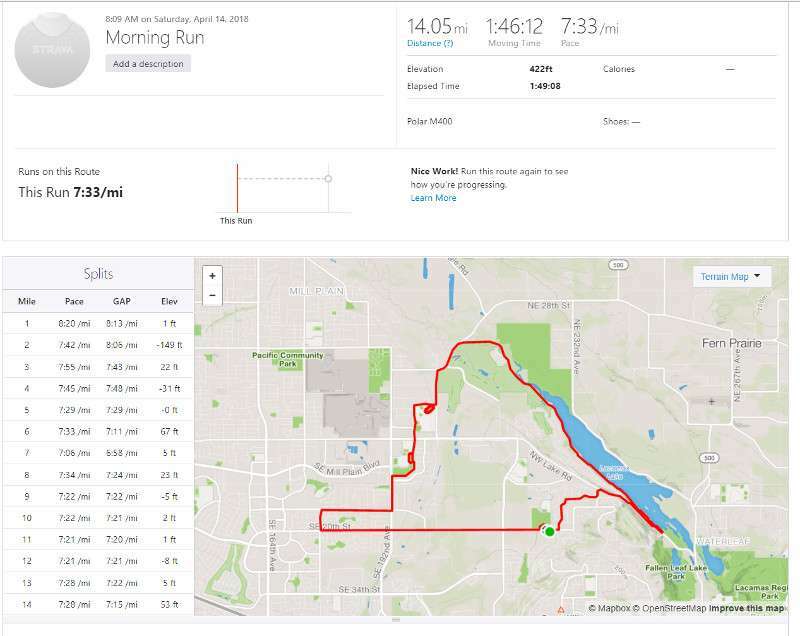 The 2018 Foot Traffic Flat Marathon will be held on July 4th on Sauvie Island, OR (just outside of Portland, OR) and I have a goal of trying to break 3:00 hours. You can follow my training as I post details of my workouts from now until race day. If you’re currently training for a race, comment at the end of the post with details of your weekly workouts. If you’re not training for a race, compare one of your older plans to what I’m doing and ask any questions. If you’re not using a plan and/or training for a race, try some of the workouts (you may have to adjust paces (faster/slower). Bottomline, there will be plenty of details and full transparency. My goal is to show everything. I’m showing you the last 12 weeks of my training program. I’ve actually been training since the beginning of March and I’m always running, so I had a good base before the program started. I tell you this, because it’s important to understand that I didn’t start from 0 and suddenly complete 25-30+ miles/week. Here’s my Strava link. If you’re a member, you can view my training. I encourage comments, questions & any feedback. April 8th – 6.6 miles in Washington DC along Rock Creek Bike Trail (near National Zoo). After a week of low mileage (we were visiting colleges in PA, DC and VA), I just wanted to get in a smooth run outside (as opposed to treadmills). This was a relatively easy run, but I did try to pick up the pace in miles 4 & 5 (7:19 & 7:15). There was a big hill down to the trail from the hotel, so my heart rate became very elevated at the end of the run. Overall I felt good. This was my first run outside since Monday April 2nd (all other runs during this first week in April were on a hotel gym treadmill). Since I would be traveling again for much of this week, I wanted to get in a speed workout. 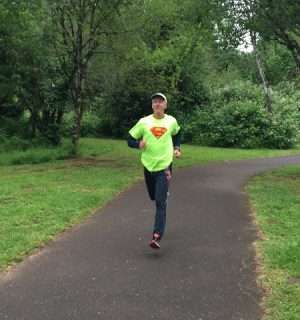 I completed a modified Fartlek with a 1.5 mile warm-up and then a mix of 1 mile @ slightly slower than marathon race pace (6:50/mile) & 800m @ slighter slower than 1/2 marathon race pace (6:35/mile). My rest in between intervals was approx 1/4 mile at easy pace. April 10th – 5.5 miles at easy pace in Allen, TX (right outside Dallas). The purpose of this workout is to recover from yesterday’s hard workout. Since I’ve also been in a plane for the last 2 days, it’s essential that I incorporate something easy into my plan where I can simply get any tightness out of my muscles and get the blood flowing to delivery rebuilding nutrients to my muscles. Recovery jogs are also used in between intervals during my track workouts. It’s critical to slowdown sometimes. There is no other goal of these recovery days. Therefore, these runs last only 35 to 45 minutes. Sometimes shorter the better. Finally some nice temperatures that allowed me to run in t-shirt and shorts. April 11th & April 12th – No activity. Sometimes I get up early to run in the hotel gym, but I was too tired on the 11th. I had a business dinner with clients and didn’t get back to the hotel until after 900pm, so I decided to take the day off. I typically don’t take 2 days off in a week, but on April 12th, we had to start early (leave hotel prior to 700am). I flew back to Portland later in the afternoon. I took the 2nd day off because I felt tired and didn’t think that jumping on treadmill or stationary bike at 800pm would be beneficial. Sometimes life happens. Don’t let it get you down and don’t try to make it up on the next day you exercise. I’m a believer in staying with the plan and if I miss, modify if possible, otherwise, don’t worry about it. April 13th – Crossfit training at gym. Typically my Fridays include a crossfit workout with a group of middle age athletes. We’re lead by a very fit an energetic woman. The workout is called “Bike Blast” it’s 45 minutes alternating 1 minute on a stationary bike with 1 minute of conditioning exercises. This is a hard workout and really helps to build strength, while burning calories. On this day, most of the conditioning workouts were with barbells. We did overhead presses, arm curls, tricep curls, squats and also a lot of core work. Overall it was a great workout, especially after a few days off. April 14th – Long run. 14 miles. Since the terrain for Foot Traffic Flat is flat, I seek out long runs that don’t include hills. This differs from how I train for the Portland Marathon (which has a big hill (bridge) at mile 17) and Boston. The purpose of the long runs is primarily to get time on your feet. Most plans include one every 7 to 14 days. The long run will improve your endurance and is arguably the most important part of your marathon training. There’s a lot written on how long and fast this run should be. I like to go at an easy, conversational pace with my heart rate some where between 70% – 80%. When you start your plan, you’ll have an 8 mile run and gradually we’ll get up to 16 – 19 miles. At this part of the schedule, these are slow runs, but I like to occasionally pick up the pace very slightly to help me adapt to the stimulus of being on my feet for 90 minutes to 2 1/2 hours. Generally, try to keep the effort easy. There will be long runs later in the plan where I finish fast. Below are the details of my run. Including course and pace. As you can see, I started easy, but did get the pace to around 7:20/mile pace. This is approx :30 slower than marathon race pace, so it didn’t feel too fast, but I could I could have gone a little slower. Sometimes when I run on my own, I go a little too fast. This is why it’s nice to run with others and really keep a conversation. Bottomline, for this workout, I felt very comfortable and my breathing was easy throughout the run and my legs felt fresh.